We hear it all the time: brands need to develop a solid foundation on social media. They need to network, promote products to their audience and make their brand personable. While this is doable, businesses must have a marketing strategy. It’s unrealistic to get onto Instagram and automatically be successful. Unless you have a team pushing your brand every day, and publishing content frequently, it’s hard to gain traction. So how do we develop a marketing strategy? First and foremost, hashtags are necessary. A hashtag is the pound sign located about the four on your keyboard (#). There are hashtags for literally anything and everything under the moon. Want pictures of cats? #catsofinstagram has over 59 million+ followers. If you post pictures of your book covers, these hashtags are popular: #bookworm (7 million+ followers); #bookshelf (1 million+ followers; and #bookcovers (7 million+ followers). When using these hashtags, research them well. You want to use dominant hashtags that have a strong following. This ensures that people will see your content. It increases the chances that you’ll get followers, likes and comments. Social media influencers are another marketing strategy. Think carefully about your niche. Who on Instagram is posting content like yours? If you’re a pizzeria, look for similar pizzerias. They don’t necessarily have to be located in your geographical area. But social media influencers agree to work with you. They post your content if you agree to post theirs. In the writing world, it’s the equivalent of guest posting. I’ll provide you web traffic if you send it back to my site. Followers from both accounts are able to see both profiles. You can tag the social media influencer’s account by using the at sign located above the two on the keyboard (@). Place it before their name and they will be tagged in the post. 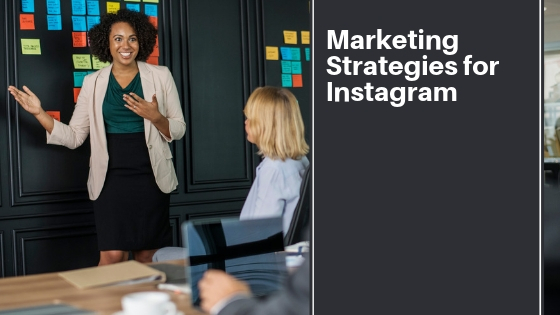 Likewise, it’s crucial that you engage your Instagram audience. Don’t just post quotes. Don’t just post behind-the-scenes photos from the office. While your audience enjoys these photos, they want to see different content all the time. Post a video, a promotion or a photo related to your brand. If you have a series that you started, post a photo in relation to it. Keep your content fresh for the viewer. Posting too many similar photos together can make your content go stale. The viewer gets bored and wants to see new. They want to see different. Give it to them or they may go astray to your competitor. Keep their foot in the door by keeping the content interesting and interactive. On this note, involve the customer. Use call-to-actions to your advantage. A call-to-action tells the customer to do something. Take a look at this: Click on the link to get a free t-shirt! A call-to-action, I believe, has two parts. The first part is what the customer has to do. They have to click on the link. But what is the point? What’s the incentive? These days we live in a bargaining society. Everybody wants a freebie, a bargain or a promotion. The customer has to get something for their action. So, in this case, the customer gets a free t-shirt. This is known as click bait because it encourages the customer to click on the link. Another way to market your content is this: cross-post your images. Link your Instagram to your business Facebook page. In essence, you should connect Instagram to every social page you own. The five main social networks you should share it to are (excluding Instagram, of course): Facebook, Twitter, LinkedIn, Twitter, and Pinterest. Share out your content. Encourage people to follow your content on Instagram. This is going to boost your following and your credibility. As you post more frequently, followers are going to trust your brand. Engage and interact with those that comment. This is going to make you humanistic and personable. It shows that you are comfortable stepping away from your logo. Finally, don’t overwhelm your audience. In other words—I don’t want to see ten cute kitten pictures from your account in one day. Okay, bad example but you get the point. When you post too much, it’s like that pesky door-to-door salesman that won’t go away. He tries every sales pitch until you finally pay attention but then you just zone out. If you post ten pieces of content in one day, you have lost me by your 3rd or 4th image. It’s not that people don’t care, but your audience is not on Instagram all day and all night. They will not see each and every post. Those that do will feel as if they are being sold to, while those that don’t see your posts aren’t able to like or comment it. Post content at specific times in the day, unless you’re running a promotion. That’s my only exception. I hope this has helped you get your Instagram off the ground. Instagram is quick and fun to use. Just don’t forget to have fun with it!